(PM Modi US visit) Prime Minister Narendra Modi, during the second phase of his three-nation tour, left for Amsterdam after meeting Donald Trump on Monday, 26th June 2017. Mr. Modi received a warm welcome when the host invited him for dinner at The White House at the first place. Also, Mr. Trump congratulated Mr. Modi on India being one of the fastest developing countries. The joint statement proceeded including some serious discussions upon several topics and the hot topic being “an inherent tension between America first and Make in India.” Trump wants to keep jobs in the US, whereas Modi ji expects MNC’s to invest in India. Modi ji also met top American CEOs including Apple, Microsoft and Google discussing on various issues with job creation, investments being on top of the list. Although the decision still lies in their court and as Indians what we can do is just keep a positive hope for the best. Addressing India as a true friend, both the countries joined hands together to eradicate Islamic terrorism from the country. Terrorism has always been a scourge and having the cooperation from America gives us the eternal strength to fight against it. Climate change which was the main agenda during Mr. Modi’s engagement with Mr. Obama did not come up in the joint statement with Mr. Trump. Also, Mr. Trump assured that India will be allowed to double its coal production by 2020. The US has cleared the sale of 22 unmanned Guardian drones to India, with the deal being termed as a “game changer”. The deal estimated to be worth $2-3 billion, has been approved by the State Department. India will be hosting the next edition of GLOBAL ENTREPRENEURSHIP SUMMIT Mr. Obama’s foreign policy initiative to bring together global entrepreneurs and investors, later this year and with Mr. Trump’s daughter Ivanka leading the US delegation, the event is going to be a grand one. 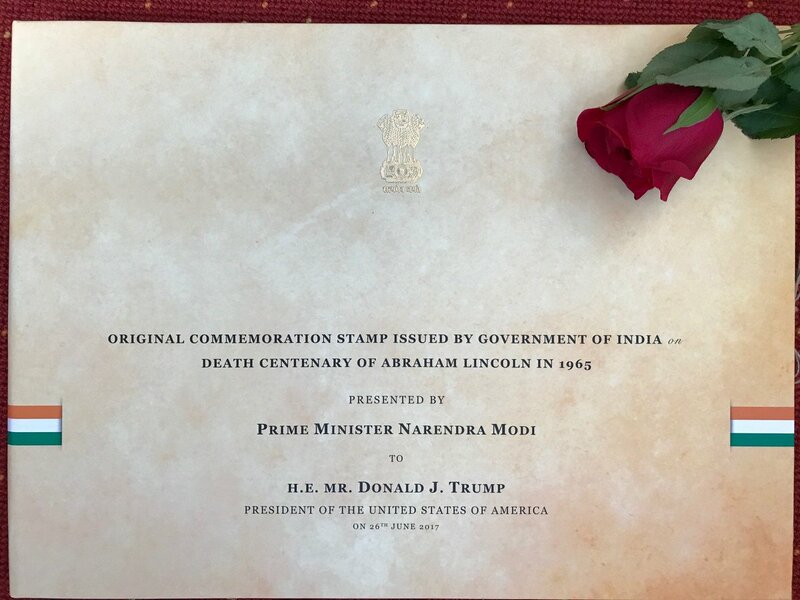 After spending some quality time establishing some healthy relations with the US, and hoping for a fruitful outcome from this joint statement Mr. Modi completed his visit and bid a good bye to Mr. trump inviting him and his family for a visit to India and presented him with this token of love. Optimistic, jovial and an approachable content writer :) loves to explore the unexplored!! Writer at The News Geeks.